Growth, Success, and Community Involvement Leads to Ensunet's Selection as 2017 Small Business of the Year! SAN DIEGO, Dec. 5, 2017 /PRNewswire/ -- With more than 600 San Diego industry leaders looking on, founder and CEO, Paul Robinson accepted the award on behalf of his team when it was announced Ensunet Technology Group was the 2017 Small Business of the Year. This scene took place this past weekend as attendees packed the San Diego Air and Space Museum in support of the 7th Annual Scholarship Fundraiser and Gala hosted by the Central San Diego Black Chamber of Commerce. "Our team being recognized by and in the presence of so many respected business leaders is truly humbling," said Paul Robinson as he reflected on the events of the evening. "To say I'm proud of each and every member of the Ensunet family would be a classic understatement. This type of success only happens when true commitment and open communication exists. Ensunet succeeds because everyone has the ability to affect positive change for us and for our customers." "Philips is thrilled to see one of our key suppliers achieve this recognition," says Eddie Alexander, Small Business Liaison Officer. "Philips is committed to partnering with our suppliers to deliver superior value while working with trend setters like Ensunet to have a positive and lasting impact on them and their communities." 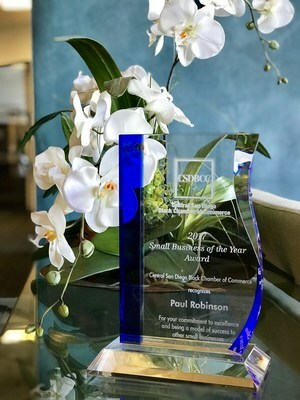 "Congratulations to Paul Robinson and Ensunet for being named CSDBCC Small Business of the Year! It's great to honor an up and coming successful company, but it's even better when that company is homegrown; Mr. Robinson not only grew up in Southeast San Diego, but he still lives in the same neighborhood today!" echoed Bruce Mayberry, Senior Diverse Enterprise Advisor for San Diego Gas & Electric and Chairman of the CSDBCC Board of Directors. "Our relationship with Philips Healthcare has been part of our growth the past three years; Philips recognizes the value of small business and a diverse supply base," adds Paul Robinson. "Ensunet is the beneficiary of many blessings to include new and longtime colleagues, friends and partners who have helped us recognize and respond to growth opportunities over the years. We will continue to support the communities in which we live and work, and look forward to developing new relationships and greater opportunities in 2018 and beyond." Ensunet Technology Group is a growing information technology consulting, services and solutions company founded in 2008, that continues to earn the trust of small and mid-tier organizations, industry-leading global innovators and agencies of the U.S. Government. We earn trust by listening so we can develop and deliver best-in-class solutions that are effective, efficient and in keeping with industry best-practices. Our team brings over 30 years of public and private sector experience and is acutely focused on post-merger IT integration; the design of enterprise data centers and campus networks; IT implementation; virtualization and data center consolidation. Based in San Diego, Ensunet is a small, minority-owned business concern currently participating in the U.S. Small Business Administration's 8(a) Business Development Program. Visit us online at www.ensunet.com. Royal Philips is a leading health technology company focused on improving people's health and enabling better outcomes across the health continuum from healthy living and prevention, to diagnosis, treatment and home care. Philips leverages advanced technology and deep clinical and consumer insights to deliver integrated solutions. Headquartered in the Netherlands, the company is a leader in diagnostic imaging, image-guided therapy, patient monitoring and health informatics, as well as in consumer health and homecare. Philips' health technology portfolio generated 2016 sales of EUR 17.4 billion and employs approximately 73,000 employees with sales and services in more than 100 countries. CSDBCC is a 501(c) non-profit organization whose mission is to create generational wealth through business enterprise, education, employment, and investments. The Central San Diego Black Chamber of Commerce utilizes innovative programs, networking opportunities, and business partnerships to advance and strengthen Inclusive Economic Development throughout the City and County of San Diego. 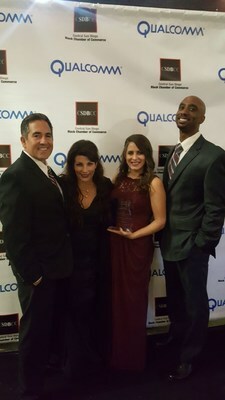 Visit http://sdblackchamber.org/ for more information.